Actually, COMPLEX 90 – the new Mike Hammer novel – will be published tomorrow, since I write these blog posts a day in advance. The cover we’re showing off here is the Blackstone audio version, read by Stacy Keach. 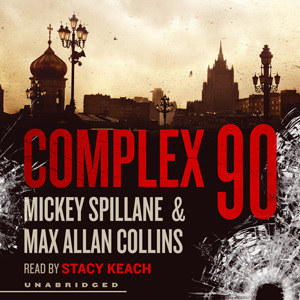 I haven’t heard it yet, but it’s one of the greatest joys of my career to listen to Stacy reading these Spillane/Collins novels on audio. This is, I think, one of the strongest of the collaborative Hammers, as it answers a lot of questions about Mike and Velda’s relationship, and it’s a sequel to perhaps the Mickey’s best book of the ‘60s – THE GIRL HUNTERS. Yes, the Dragon (the surviving half) is back. What great fun, writing about Mike Hammer in his espionage agent mode in a book begun by Mickey at the height of the James Bond spy craze. Fun, too, imagining Mickey as Mike in a movie playing in your demented brain. Well, my demented brain, anyway. People often ask how I decide what order to do these books in – I had half a dozen substantial (100 pages or more) Spillane “Hammer” manuscripts to choose from. GOLIATH BONE was a no-brainer choice – it was the final book Mickey was working on, and was the longest manuscript (of the Hammers, that is – DEAD STREET was shy only of the last three chapters). Also, it had a 9/11 aspect that threatened to date it. So it was first up. THE BIG BANG was a great ‘60s novel, with Hammer taking on drug racketeers, and just a great manuscript from Mickey, with one of his most outrageous endings. It won second position as a way to really show off Mike at his best. KISS HER GOODBYE, with its ‘70s setting and themes, was a natural progression. I held back the greatest find – LADY, GO DIE!, the unfinished sequel to I, THE JURY – for the fourth position, because my initial contract was for three books, and I wanted something very strong to launch the second trio, particularly if I had to change publishers…which I did. COMPLEX 90 needed to be held back a while, because the anti-Commie aspect of it would only court trouble with the Hammer haters. I needed Mike to be back for a while before going there. Also, though Mickey wrote about Russian espionage in ONE LONELY NIGHT and THE GIRL HUNTERS, the Cold War theme is not what Hammer is best known for. Shortly (yet this month) I will begin work on KING OF THE WEEDS, a novel designed by Mickey as a sequel to BLACK ALLEY and as the final Hammer novel. Mickey set it aside after 9/11 seemed to require Mike Hammer to wade into the war on terror. So these six novels begin with the final Hammer novel (THE GOLIATH BONE), and wind up with what Mickey had intended to be the final novel (KING OF THE WEEDS), making that the penultimate one, I guess. Is this the end of the Spillane/Collins Hammer stories? Probably not. I am expanding short Hammer fragments into short stories (most recently in The Strand, “So Long, Chief”), and in two or three more stories will have enough for a collection. There’s also the possibility of doing a book that offers prose versions of the two audio plays. And there are three more significant Hammer fragments that I hope to turn into novels. When I say “substantial” unfinished manuscript, I mean that Mickey left behind at least one hundred pages and often plot and character notes. When I say “significant” unfinished manuscript, I mean at least forty pages and sometimes plot and character notes. I am hopeful readers and my current publisher will agree that the Mike Hammer canon should be completed. I see no reason for me to do original Hammer stories, not with the wealth of Spillane material at my fingertips. There are even non-Hammer fragments that could be Hammer-ized if need be. If the movie happens, anything is possible. Last week was taken up with preparing materials for my producing partner, Ken Levin, to take with him to LA for meetings. Barb and I wrote up a TV proposal for the ANTIQUES series, and I put together an Eliot Ness in Cleveland TV proposal. In addition, I did a full-scale rewrite of “House of Blood,” turning it from an 85-page feature film script into a 58-page TV pilot script. This week I’ll be meeting with Matt Clemens to work on the plotting of SUPREME JUSTICE, my second Thomas & Mercer novel. My friend Brad Schwartz and I have been working on a Teddy Roosevelt project, and the screen treatment of that will be finished probably today. Then I will be doing articles for Huffington Post and other web sites to promote COMPLEX 90. Did I mention it’s coming out today? A lot of Net activity to report and share. A Minneapolis radio station has Part One of the Gary Sandy-starring version of MIKE HAMMER: ENCORE FOR MURDER produced at the International Mystery Writers Festival in Owensboro, Kentucky, last year. They will post Part Two next week. This is a lot of fun, but the host gives perhaps the most shambling introduction I have ever heard, starting with a discussion of the character “Mickey Spillane” who debuted on radio before the publication of I, THE JURY. You learn something every day…. The great web site Bookgasm had a lively, complimentary review of ANTIQUES CHOP, now a bouncing baby one week old. Here’s a nice write-up on COMPLEX 90 at the Geek Girl Project. I haven’t listened to this interview, but I was on the phone a long time, so be forewarned that you may need Red Bull to make it through. The guys interviewing me were great, but I’m afraid I blathered even more than usual. Here’s a cool Nerds of a Feather write-up of COMPLEX 90 (out today!) (over doing?). The news about HOUSE OF BLOOD winning that IMPA award was covered neatly at the Fangoria web site. The SEDUCTION OF THE INNOCENT reviews are still comin’ in! Check out this cool one at Nerd Bloggers. I was very pleased by this NO CURE FOR DEATH review – having a smart reviewer approve of a book written forty years ago is kind of amazing. Not as amazing as me writing it when I was six, but amazing. And at this late date, we’re still being told that ROAD TO PERDITION was based on a graphic novel. Who’da thunk it? THE TITANIC MURDERS gets a very nice write-up here. And, finally, here’s the review you were all waiting for – of SKIN GAME, the second DARK ANGEL book (not published today…but still in print!). Matt Clemens co-wrote the DARK ANGEL novels with me, and they are among our best collaborations, in both our opinions.